So now it is confirmed, this is international terrorism, sophisticated and well planed in advance from help abroad. We are witnessing the story evolve with the typical scenarios we hear from the past. Mr. Farook, the F.B.I tells us was an American citizen, and Ms. Malik traveled to the United States together in July 2014, says David Bowdich of the F.B.I. in Los Angeles at a news conference. 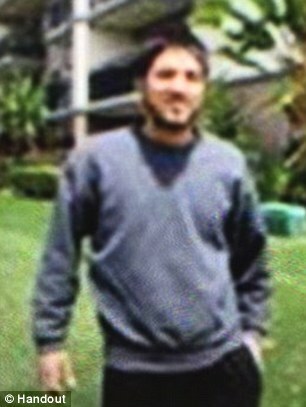 But Tashfeen Malik (or even possibly Tashkeen Malik) as some unconfirmed social media reports say was not his wife and not the mother of his daughter. There are so many conflicting reports. His wife could be Russian born Tatiana Farook. Malik could possibly be this Russian girl or even might be a newer wife. And now they report that his brother was active in the U.S. military. Now they say that the Russian is the brother’s wife and Malik is a Pakistani Jihad-bride. And while they filter through the confusion and to ensure that the system did its job, Bowdich adds that as a routine matter, to obtain the green card the couple had to prove that their marriage was legitimate, and Ms. Malik had to provide her fingerprints and pass criminal and national security background checks using F.B.I. and Department of Homeland Security databases. And no matter how this end up, the system failed. And if this is the case, expect thousands (ISIS has a goal of ten million Americans) to be massacred shortly. Having lived as a terrorist myself and having family who dodged the best FBI databases, this process is a joke as I will show here. Over and over again, investigators examining the terrorist network point to a common thread — the ease with which many in the network travel the world using fake passports or illegally obtained immigration documents is at a relative ease. For example, terrorist Ahmed Ressam, used a counterfeit French passport to enter Canada and apply for political asylum. While living there, he supplied fake Canadian passports to other terrorists. And he used a fake Canadian passport under the alias of Benni Noris in his successful entry into the United States and attempted to bomb Los Angeles International Airport. My cousin, Eiad Salameh who was involved with the movie-maker who directed Innocence of Muslims, Nakoula Basil Nakoula, who worked selling drug shipments to Hezbollah from the U.S., similarly entered Canada under a fake name Gabriel Ramzi, sold a ton of passports to nefarious individuals and was even allowed to escape by the F.B.I. when he was finally captured in Canada. What is common with such cases is one thing–the names on these identification documents is not the real individual who could have a wrap-sheet a mile long as Eiad and Resam and thousands others did. As we stated earlier, I can bet the farm that Farook’s wife, Tashfeen Malik is not Tashfeen Malik. It is possibly a code-name (explained here) and the so-called Tafsheen has a record a mile long in terror activity. And as far as his brother being active in the U.S. military in fighting terrorism does not mean loyalty. I have a brother who served in the U.S. Air Force and is more loyal to Islam. 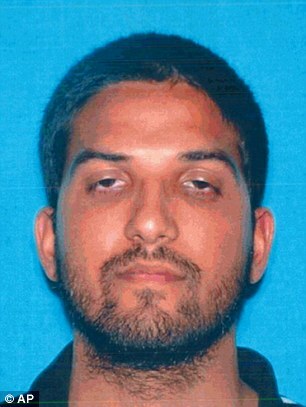 So now they tell us that this photo is the good Farook and the bad Farook is below. The F.B.I reveals that Farooq went to Pakistan where his wife resided. It would be impossible to know her true identity since thousands of foreigners have illegally obtained Pakistani national IDs including Jihadists from China, the Maldives, Uzbekistan and the United States. Why does the U.S. allow anyone from Pakistan entry to the U.S. boggles the mind. The system is not only broken, but it is nearly impossible to fix unless profiling and stopping immigration from Muslim countries is established. While profiling (so they argue) is not 100% fool-proof, it is at least 80-90%, and yes, shootings are common in the U.S., but why do Americans import additional shootings boggles the mind. As I always say, the West only learns through high-death toll. If anyone objects to what I said, perhaps they can examine their politically accurate option. So here it goes. Terrorists can carry more than one passport. A stolen or fake Saudi Arabian passport for example is a prize. Two of the Sept. 11 attackers used stolen Saudi Arabian passports because Saudi Arabia is a friend of the United States and so using their passport makes it easier to get in at the border. Yet we still allow Saudis (the most notoriously Wahhabist state in the world) an easy entry. Then there is the problem with fake or re-obtained birth certificates from dead individuals are easily done, then to acquire a passport from these birth certificates is a breeze. This practice allows terrorists to get legitimate passports, using an alias, which will be basically foolproof at border crossings since such aliases have no database. The birth certificate is such a weak document for certifying identity and if it trumps all the U.S. State Department procedures for verifying birth certificates, since every state is different (the process is not computerized or centralized in any way) how will it be if such birth-certificates are foreign? Ms. Malik (Farook’s wife) had been traveling with a Pakistani passport which could likely be fraudulent and a K-1 visa, a special visa for fiancés that allows people to come to the country to marry an American citizen (regardless if he is Muslim) gets you a top-notch pretty female Jihadi. Mr. Farook applied for a permanent resident green card for Ms. Malik on Sept. 30, 2014, within the legal 90-day limit, a federal official said. She was granted a conditional green card in July 2015 and by Christmas season, the Muslim terrorists can ruin the joyful spirit by committing a massacre. So much for “its the season to be jolly” Allah Allah-la-Hu-Akbar-La. Unless the U.S. profiles, stops student visas including any entry from countries with high terrorism, the U.S. will witness higher death-tolls. The other option is that even if the U.S. improves the system the largest security services in the world, led by the US and British intelligence services even the Russian have difficulty thwarting the Lone Wolf terrorist method and ISIS now is heavily promoting this agenda on social media on a massive scale. And for Americans who might think that technology is their specialty, that monitoring information going back and forth is easy, think again. An FBI agent monitoring a Telegram group (which has tens of thousands) requires each agent to participate in a series of discussions intended to vet your beliefs in order to be fully accepted. In other words, in the U.S. terrorism task forces that moved from drug busting into terror busting now must be like myself and know Islam inside out. And its not only knowing Islam, they must know how to conduct such discussion in Arabic and know about various religious edicts to terrorist incidents to specific battles. Just like the San Bernardino couple, a lone wolf is not only a very ordinary person living in the community as a member, they also behave like them in that they do not have any unusual activity or act suspicious. They are encouraged to cover up any sign of religious affiliation and are encouraged to keep a low-profile in the mosque. They do not belong to any form of criminal or neurotic gang. They are away from the eyes of observers as being a member of a terrorist organization. These are perfect for ISIS’s plan for mass destruction. Any pre-emptive strikes carried out by the security apparatus is useless in preventing these terrorist attacks, because pre-emptive strikes are usually with groups or formations who are usually caught in the course of planning, preparation, and before implementation, which the act fails before it happens where a city like San Bernardino ends up looking like a war-zone. The lone wolf plans and attends and performs without dispensing any information. Even the people closest to him, as his wife or his father or his mother are not made aware of his/her plans. He keeps everything in his mind as part of the plan until such time when the bomb is to explode. Muslim terrorists have the ability to “go dark”. U.S. intelligence agencies are finding it increasingly difficult to track communication among the terrorist organization’s members. Many officials have blamed the group’s adoption of sophisticated encryption software, such as the web browser Tor or the messaging app Telegram, for the inability to identify potential threats. Security now has a tougher job, to avoid being monitored, they’ve shifted to encrypted chatting platforms becoming increasingly careful to secure their communications. A member’s ability to encrypt is an important factor in how the organization values him or her as an operative. As a result, members are learning different tools faster, creating a much bigger problem for intelligence agencies trying to track their communications. Then you have group chats on Telegram that are specifically dedicated to propaganda can have up to 16,000 members, and are growing by the thousands every day. We have explained before these revelations how this has all the hallmark of an ISIS terror ring and also why it was impossible to detect which will cross the eyes of any seasoned F.B.I agent. We explained all this to police officials On November 13, just prior to the Paris and San Bernardino massacres to no avail as you can see, the District Attorney of New Jersey cancelled all training by “Islamophobes” like myself. As we learned from you: you can take the horse to the water, but you can’t make him drink. Until the next massacre, Merry Christmas.